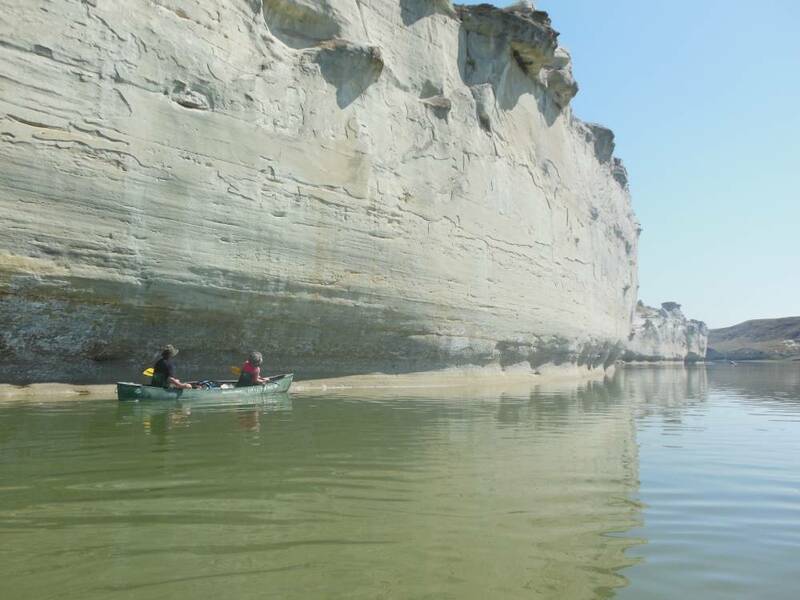 You will enjoy paddling the gentle and meandering current through breath taking White Cliffs of Eagle sandstone and igneous rock formations. Our camps include Eagle Creek and Slaughter River, both Lewis & Clark campsites. Throughout this trip, you will have plenty of opportunities for on-shore exploration. Some highlights include Native American teepee rings, petroglyphs, narrow slot canyons, Hole-in-the-wall rock formation, plant identification, wildlife viewing and USGS markers for L&C campsites. Canoeing the Missouri appeals to beginner and experienced paddlers alike. The gentle meandering current allows you the solitude to paddle your own tandem canoe a long side our guides. Large canoes may be available with advance notice for larger groups. We take pride in their camp menu. 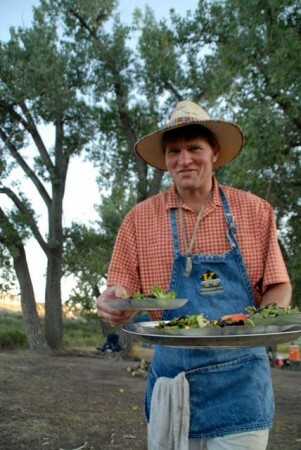 Meals should be something you look forward to and expect more than your average camp cuisine. Start your day with a good cup of coffee and a hearty breakfast like pancakes & sausage with fresh fruit & juice, lunch is welcome stop with sandwiches made with quality deli meats & cheese, lots of fresh veggies & snacks, dinner might be grilled flank steaks, dutch oven potatoes, colorful salad, bread from local bakeries. Beer and wine, in moderation, is provided with appetizers & dinner. Water, sodas, lemonade/gaterade is also provided. We are happy to accommodate various dietary needs so let us know your requests. The 3-day itinerary allows you to fully experience White Cliff section of the Missouri and nicely fits into an itinerary for those visiting Montana. If you are looking to continue following the Lewis & Clark Trail, plan a hiking trip on the Lolo Trail, retracing their arduous journey overland across the Bitterroot Mountains. This off the beaten path adventure is for those who seek the remote sections of the trail. Vehicle supported hiking walking or van tours can be catered for all abilities 1-3 days. Lewis & Clark Trail Adventures is the only outfitter licensed and permitted on the Missouri River and Lolo Trail. The 4-day itinerary paddles the same section of river as the 3-day trip. Day 2 of the 3-day trip is split into day 2 & 3 on the 4-day to allow extra time for on-shore exploration or discussions depending on the trip theme. 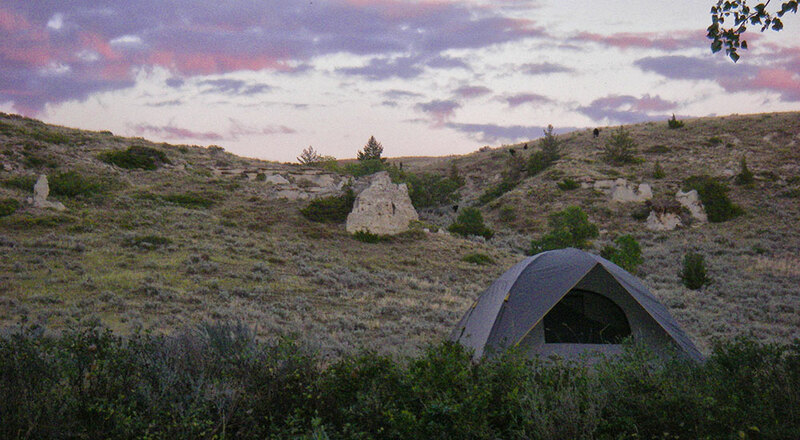 We add a nights camp at Hole-in-the-Wall campsite, located on a bend in the river with views of the Hole in the Wall rock formation. We alter the hiking schedule, so that the two major hikes (Neats Coulee at Eagle Creek and Hole-in-the-Wall) are done in the morning vs. in the afternoon or mid-day. 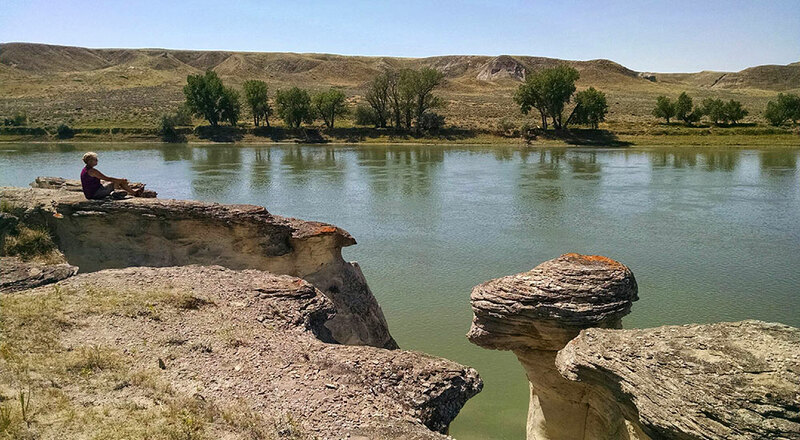 For a more extensive trip on the Missouri, extend the journey down the river less traveled, from Judith Landing, where our 3-day trip ends we enter the Badlands of the Upper Missouri. The topography changes from Eagle sandstone and igneous rock formations to the high & grand bluffs of Claggett shale. We continue camping at Lewis & Clark expedition campsites of May 27 & 25, 1805, passing the bluffs near Bullwacker Creek where Lewis first viewed the Rocky Mountains. As we enter the Charles M. Russell Wildlife Refuge, wildlife viewing opportunities abound. In this protected area elk graze, bighorn sheep climb precariously in the bluffs and water fowl thrives in the natural riparian environment. Throughout the season, we offer Missouri River trips with special guests who bring an added element of knowledge to our trips, these trips are always popular, so make sure you reserve early! See more below or follow the links in the blue left side bar. In addition to the dates below, we have may open dates May – September contact us for most current availability. May 20-22 – Late spring trip, enjoy the solitude and scenery before the summer season kicks in. June 21-23 – Summer Solstice with The Meriwethers, educators & musicians combining songs, storytelling and historical readings, FUN! Custom dates may be available – Let us know your preferred dates and we will do our best to accommodate. Look forward to padding the White Cliffs! July 8-11 – Featuring Ray Risho’s Mediterranean Port’s of Call – Culinary Presentations and 4 Course Dinner with Safari Style camping. July 1-6 – This trip is an extension of our 3-day trip July 1-3 listed above. The Missouri River Canoe Trip and the Lolo Trail Hiking Trip are available as separate activities and therefore must be booked as separately. Please let us know any questions. Hope you can join us! Pre-trip: Our Missouri trips meet in Fort Benton, MT. Fort Benton is a quaint & quiet river town, but packed with history. We suggest spending an extra day there. We have a pre-trip meeting the day prior to your launch date at 6pm outside the Grand Union (Unless you have alternative or custom arrangements) At the pre-trip meeting, we make introductions, go over last minute questions, logistics and hand out dry bags for you to pack your personal gear. If you cannot make the pre-trip meeting, send an email to make alternative arrangements. Morning of your launch date: We meet at 8:30am. 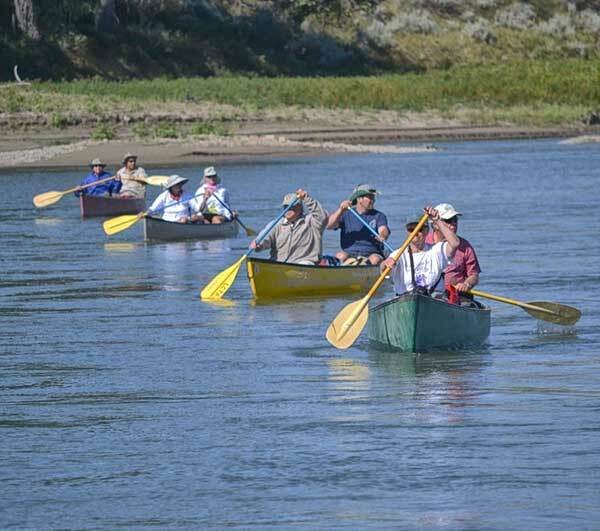 We provide transportation from Fort Benton and begin paddling from Coal Banks Landing, 45 miles downriver from Fort Benton. Your personal vehicle or rental car can be parked at the public parking lot at the Fort Benton boat ramp across from the Fort Interpretive Center, down the street from the Grand Union or other lodging locations. Feel free to call us for suggestions or to help plan a custom itinerary. Beverages including drinking water, Gatorade or sparkling water and/or soda. Beer & wine in moderation 2 per person. Need trip insurance? For your convenience, we offer travel protection through Travelex Insurance Services. For more information on the available plans or to enroll, go to www.travelexinsurance.com or contact Travelex Insurance Services at 800-228-9792 and reference location number 26-0048. "The hills and river cliffs which we passed today exhibit a most romantic appearance…. Here it is that nature presents to the view of the traveler vast ranges of walls of tolerable workmanship, so perfect indeed are those walls that I should have thought that nature had attempted here to rival the human art of masonry had I not recollected that she had first began her work… As we passed on it seemed as if those seens of visionary inchantment would never have an end."